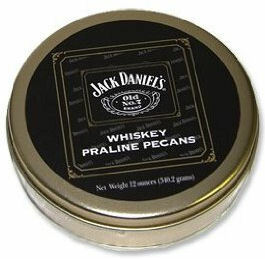 So I take my pralines where I can get them. 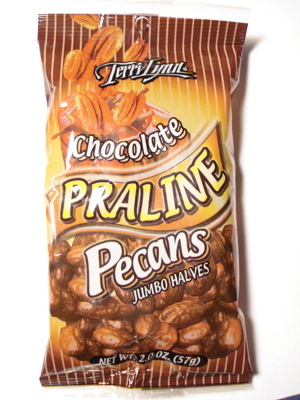 In this case, that meant picking up a free sample bag of Terri Lynn Chocolate Praline Pecans at the All Candy Expo. 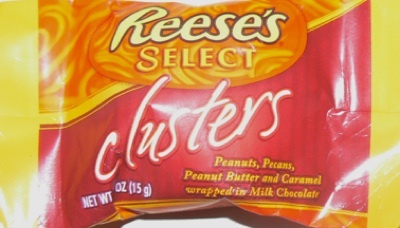 Pictured on the package, they donâ€™t look very pretty â€“ odd bumpy objects with inconsistent-looking chocolate coverage. Inside, though, the actual pecans are, minus a few inconsistent spots, as smooth as a babyâ€™s behind. (Hey, donâ€™t most companies do that the other way around?) These things are also HUGE â€“ I was expecting something resembling a chocolate almond, but these look more like largish pebbles. I am a sucker for sales. Candy, clothes, puppies (well, Iâ€™ve never really seen a puppy sale, but you can bet if there were such a thing, I would be driving home with a car full of them) – you name it, Iâ€™ll buy it. On a recent grocery trip to my local H.E.B., I stumbled across one of their super saver sales where you buy one product and get a whole bunch of others for free. 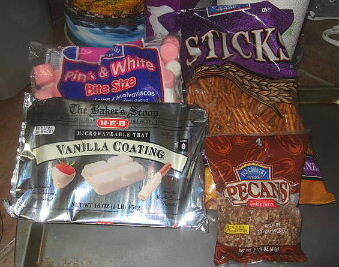 In this case, if you bought a chocolate or vanilla white chocolate coating, you would also receive a bag of pretzels, pecans, and marshmallows on the house. I didnâ€™t really need any of those things, but I figured I am always in need of chocolate for my recipes, so stocking up seemed like a good idea. Undecided about whether I wanted to purchase the milk chocolate or white chocolate variety, I bought both and thus had two of all the freebies. Once I got home and the sale-high wore off, I realized I was stuck with a lot of food I donâ€™t usually eat. If only there were some way to combine them allâ€¦. Could it be possible? I mean, pretzels, marshmallow, pecans, and chocolate donâ€™t seem like they all gel together, but who has tried them all at once? Putting my culinary wits to the test, I was determined to come up with a confectionery treat that utilized them all. The result? My January candy recipe of the month I call the Kitchen Sink Bar.